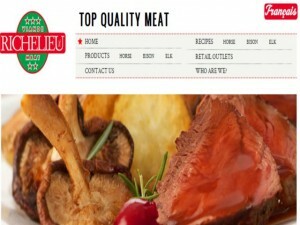 Viande Richelieu Meat Inc. is a privately owned Canadian meat processing company. It is headquartered in Quebec, Canada and specializes in processing horse meat, elk meat and bison meat. Viande Richelieu Meat was established in 1986. Since its founding, it has been engaged in breeding bison, horses, and cows, and then processing the meats of these animals. First and foremost of the company’s mission is to be able to provide high-quality meats to its consumers. In order to produce high-quality products, the company implements a strict tracking program that monitors the condition of the animals from the farm, to the condition of the products when they are on store shelves. The company’s facilities are all HACCP-certified, ensuring their customer that all health, safety measures and control methods are implemented and that what the company offers is a totally safe and high-quality product. Additionally, Viande Richelieu’s products conform to the Canadian, Japanese, Russian, European and Swiss certification standards. Viande Richelieu Meat Inc. has its headquarters in Maasueville, St. Hyacinthe, Quebec. This is also the location of their horse slaughtering and processing facility. The horses come from auctions held in North America and are subject to strict screening and ranking tests, according to the company’s specifications. The company’s Bouvry Export division is located in FortMacLeod, in the southern part of Calgary, Alberta. The company’s facility in this location is where the bison, beef and elk are slaughtered and processed. The bison and elk breeding stock also comes from this area/province. The company’s distribution and marketing division is located just outside of Paris, France, near Paris-Charles de Gaulle airport. This location allows the company to distribute and receive products throughout Europe. Products made by Viande Richelieu Meat are imported everyday from Canada and are transported by plane. As for its products, horsemeat is promoted by the company because of its abundant amount of protein, zinc and vitamin B12. It is also a meat that is very tender and rich in iron. The company promotes elk meat because it is also protein-rich, while at the same time contains low amounts of fat and cholesterol. Bison meat is found to be low in fat, but rich in protein. It is also considered non-allergenic. you are correct…horse meat is filled with drugs. J’aime bien m’alimenter pour rester en SANTE Vous etes responsable de nos SANTES Nous vous faisons confiance payer un peu plus cher cela ne Nous derange pas d’abord que c’est de la QUALITE DE VIANDE…..
How does Viande Richelieu Meat Inc. manage to “implement a strict tracking program that monitors the condition of the animals from the farm to the store shelves”, when “The horses that are slaughtered come from auctions held in North America” ? How ? I was just wondering if you could elaborate on the methodology of your screening and ranking tests performed on the horses and what this implies in terms of “quality”. Moreover, it is widely known that you are definitely not conforming to EU standards. In your description of your horse meat you forgot to mention that it is laced with bute, dewormers, clenbuterol and other carcinogenic agents prohibited in the human food chain. I believe you should add this to the list of ingredients to make sure that your customers know that they are getting everything they pay for, and more.